This longarm quilting design was inspired by one I saw from Laura Lee Fritz. 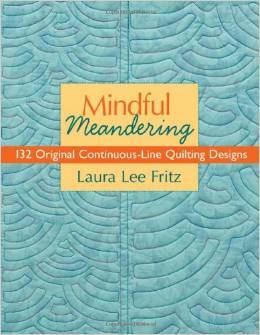 Her book, Mindful Meandering has many freeform and casual designs for overall (edge to edge) quilting. I love her breezy style. Even though her book is geared towards longarm quilters, her designs can be adapted for home machines. This t-shirt quilt needed just a touch of something wonderful and I think this design does the trick. Carol V. made this beautiful t-shirt quilt. T-shirt quilts are very fun to make (I have several) and no matter how you put them together, they work. I do love Carol’s tilted approach! And if you are interested in this book, click on the link below which will take you to amazon.com to purchase it.